Super typhoon Yutu is moving west southwest at the speed of 15-20 kilometers an hour, expected to enter the East Sea at the end of this month or early next month, according to National Hydro Meteorological Forecasting Center. At 7 a.m. this morning, the storm was positioned 370 kilometers east of Luzon island, the Philippines. Strongest wind near the center of the typhoon was measured at level 14-15, traveling 150-185 kilometers an hour. In the next 24 hours, it is forecast to move west southwest at 15-20 kilometers an hour. By 7 a.m. on October 30, Yutu will be in Luzon island with wind power degrading to level 13, at 135-150 kilometers an hour. 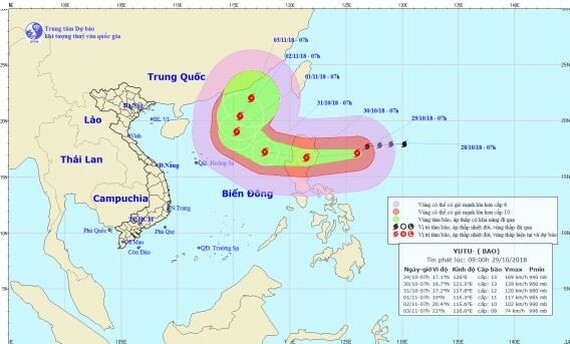 At 7 a.m. on October 31, the eye of the storm will be 570 kilometers east of the Hoang Sa (Paracel) Islands. Its fury will reduce to level 12, at 115-135 kilometers an hour. In the next 48-72 hours, it will barrel northwest at 10-15 kilometers an hour to locate 420 kilometers off the Hoang Sa Islands. 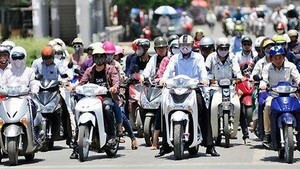 Wind power will reduce to level 11-12 moving 100-135 kilometers an hour.